The “Tool Presets Dialog” is a dockable dialog; see the section Section 2.3, “Dialogs and Docking” for help on manipulating it. 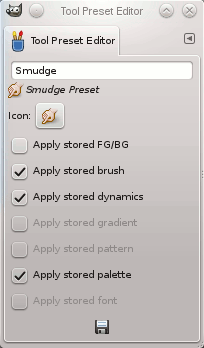 Presets can be tagged so that you can arrange presets display as you want. Please see Section 3.6, “Tagging” for more information about tagging. The Tool Preset Editor is described in Section 5.2, “Tool Preset Editor”. 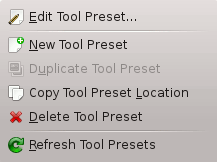 Create a new tool preset: before clicking on this button, you can either select an existing preset, or select a tool in Toolbox, for example the Healing Tool which is not in the presets list. 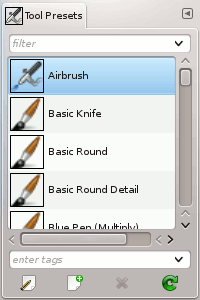 A new preset is created at the top of the dialog and the Tool Preset Editor is opened. Please see Section 5.2, “Tool Preset Editor”.